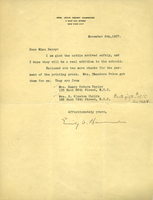 Mrs. Hammond says she is glad that the cattle arrived to the school safely, and that she is sending along two more checks for the printing press. Callen advises that Berry's request for Holstein cattle for the school will be brought to Harvey S. Firestone's attention when he returns from a trip south. Berry understands that Firestone has the best Holstein cattle herd in the country and asks that he donate some to start a herd at the school. The Berry Schools write to Mr. Cooper telling him they will not have any exhibit this year at the fair beyond their cattle. 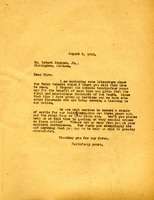 Hilton writes to Berry to inform her that her letter has been received in Penney's absence. Hilton says that Penney is only attending fairs in the mid-western states. Berry is assured of Penney's interest in the Schools but Hilton does not know of any trips to Atlanta in Penney's near future. 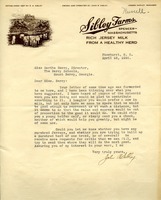 Hilton invites Berry to visit Penney Farms whenever she likes and promises to let her know when Penney will be present there to give her a tour. Martha writes to Mr. Anderson with literature about the cattle breeding and dairying at the school. She tells him about how the school is funded and hopes that the literature will reach him at a time he could help them. Sibley is willing to contribute to the Berry Schools, offering to send a young heifer calf or simply a check. He asks whether the school has purebred Jerseys and is trying to build a purebred herd. 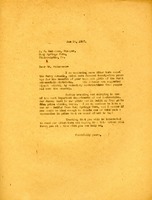 Martha writes to Mr. Jamison with some literature about the Berry schools. She also mentions they are anxious to secure cattle for the dairy herd and inquires about some kind of special price for the cattle.